CAN SLIM is a stock market technique for identifying best stocks. Identifying the best stock for the investment is a difficult task especially if you are new to the stock market. Let’s do one small exercise, take two minutes and answer one simple question. How will you identify the best stock for investment? Well, your answer will be stock market research, fundamental analysis, stock market tips, a recommendation of stock market brokers, technical analysis etc. Whatever the case, one thing is sure that if you don’t do your homework correctly you are likely to lose money in the stock market. You have to be firm in the selection of stock. If you don’t know how to select stock here is a stock market technique to identify Best Stocks for Investment. The method is known as CAN SLIM. CAN SLIM is the combination of fundamental analysis and technical analysis. CAN SLIM is a popular stock market technique for identifying best stocks for investment. It is techno fundamental strategy. CAN SLIM is a technique developed by the co-founder of Investor’s Business Daily Mr. William O’Neil in his book ‘How To Make Money In Stocks’. He is among Top 20 greatest investors of all time. 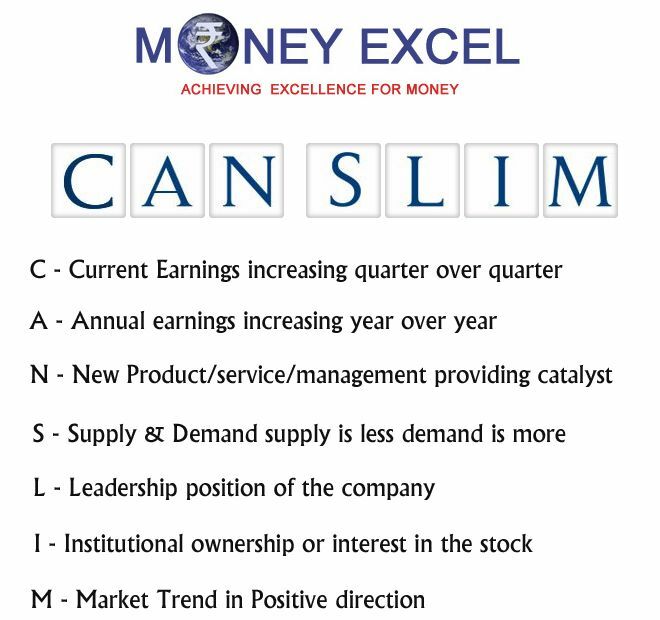 CAN SLIM means a combination of fundamental and technical analysis, technical analysis suggests an entry and exit point for stock and fundamental analysis gives confidence of holding stock. In short, it is a combination of “WHAT to buy or sell” (Fundamental) and “WHEN to buy or sell” (Technical). This strategy gives benefits of both worlds. Current Earning is an important parameter for Shortlisting Company. A profit of the company should be growing. You will find current earning in a quarterly result statement of the company. The company profit should be growing at least around 18-20% quarter-on-quarter. (Last three to four quarters). Big accelerating earnings growth attracts the attention of large institutional investors and is expected to take the stock price higher. Current earning (Last three to four quarters) is short term view. You cannot ignore the long-term annual profitability of the company. You should try to find a company with consistent, stable and sustainable profits. The profit should be growing 20-25% over the past three years. A return on equity should be 17% or above. The new thing plays a significant role in the success of a company. Most of the company who turn out as multibagger has one thing common newness and innovation. New idea, new product or services, new market, new leadership, new condition or innovation is important for growth in the market. You should find out a company that constantly innovating in product and services. A notable example of this is Apple’s iPhone. The demand for the stock must be high while supply is low. A share in short supply and higher demand, have the inherent potential to rise faster. And oversupply of shares and weak demand will cause the price to decline. You should look for stocks that have stronger buyer demand especially institutional investor must be interested in the stock. It is an important parameter when it comes to technical analysis of the stock. Mostly all industries have few leaders and many laggards. You should find out a leader and forget laggard. In order to find a leader you can use ‘relative price strength’. A relative price strength should be 70 or higher. Another way to identify leader is by PE ratio. PE ratio of leader would be comparatively higher compared to laggard. A stock in a leadership position helps a lot. The biggest market winners tend to be the fastest-growing leaders in a strong and rising industry. Institutional sponsorship or investors means FII, Mutual Funds, Insurance companies etc. An institutional investor should be interested and have a stake in the company to support a hike in price. This happens if a stock is very good for investment. A Market direction means the market trend. It is generally seen that stock moves along with the market trend. Use the market direction to time your buy and sell decisions. Market direction is categorized into three confirmed uptrend, market uptrend under pressure, and market in correction. As per CAN SLIM one should invest during times of definite uptrends. The CAN SLIM method is the simplest method to identify stocks that have a greater possibility to see a price appreciation. The entire CAN SLIM method shows seven traits and all of them should work together. Let me explain – When current earnings, annual earnings are on the growth trajectory and new product or innovation take place (the CAN of CAN SLIM method) it attracts investor and demand of stock is likely to increase (supply and demand of method). These types of stocks are likely to become a leader and institutional sponsors will be surely interested to buy such stocks. This will be beneficial to the investor during a market uptrend. I hope CAN SLIM method will help you in identifying the best stocks for investment. Do you use this method for identifying stocks for investment?